This August we will host a summer season of open-air Shakespeare atop its stunning rooftop garden. A completely unique way to enjoy the Bard’s work, the rooftop theatre will be held on Sunday 3rd August and feature scenes from The Taming of the Shrew alongside recitals of Shakespeare’s Sonnets against the beautiful backdrop of the breath-taking Cambridge skyline. 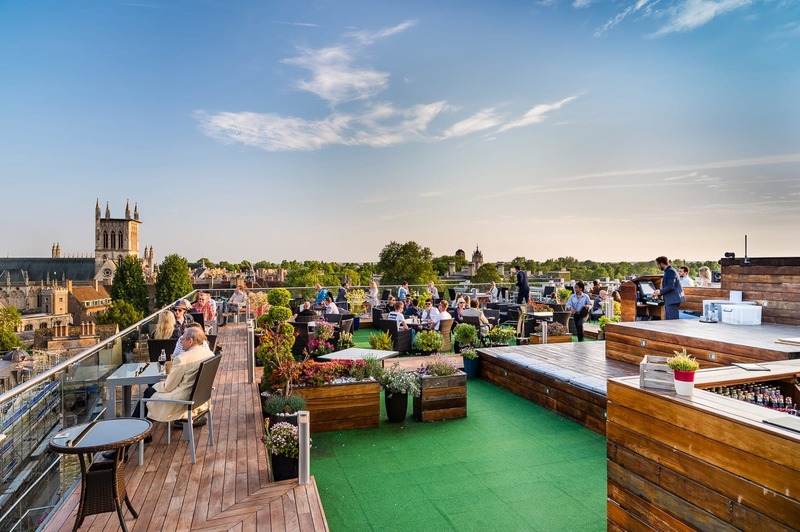 Attendees can enjoy a glass of bubbles on the roof whilst taking in the performance before tucking into a post-theatre three-course repast at The Varsity’s in-house restaurant, The River Bar Steakhouse. Head Chef’s summer menu of gourmet offerings includes choice cuts of locally-reared steak, fresh fish, gourmet pies and summer salads and promises to cater to the most demanding palate. Curated by the Cambridge Shakespeare Festival (www.cambridgeshakespeare.com), the performances are performed in full Elizabethan regalia and are designed to be enjoyed by all, from novices to devotees. All are welcome at the events, and, whether guest or local, entrance is free on a first come first serve basis! Priority tickets with dinner are also available to book at £55 per person. The performance starts at 7pm followed by a three-course dinner at the hotel’s River Bar Steakhouse. Priority Dinner places can be booked at www.thevarsityhotel.co.uk or by calling 01223 30 60 30.